1993.- Habitación 503 (Room 503) -unitary format-. 2005.- An Unusual Family, on Canal 13. 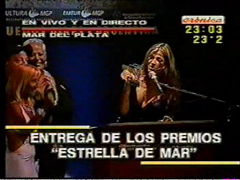 2007.- Estrella del Mar (Starfish Award) to the best variety show for "Un País de Revista 2"
2007.- Martín Fierro Award for her cable show "100% Catherine"
2006.- Clarín Award to the best variety show for "Un País de Revista".